UNAVAILABLE This item has been discontinued due to design flaws. The Samson Juicer allows you to juice not only wheatgrass, leafy green vegetables, root vegetables and fruits but also lets you make you own fresh-pressed healthy seed oils in your own home. The Samson Single Gear Juicer with Included cold press oil extractor allows you press your own oil! Make oils such as flax, sunflower, sesame, chia and other Oil Seeds. It is not ment for making other types of oils. 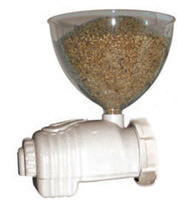 No heat is applied to the seeds when using the extractor. Some heat will be generated in the process of making your own oil. This is the second generation juicer from Samson and is target for the consumer who wants to live a healthy lifestyle which includes eating more fresh fruits and vegetables and nuts and seeds in their diet. 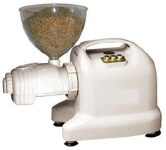 The Samson juicer allows you to process these foods so they are more easily digested by your body. The Samson juicer is a single-stage, single auger style juicer. Also called a cold press juicer, since no heat is involved when juicing or processing foods. This cold-process maximizes amount of vitamins, minerals and enzymes in the food you are processing. 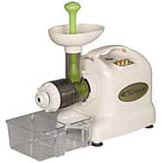 The Samson juicer is a continuous juicer. This allows you to make large batches of juice without having the inconvienece of stopping and having to empty out the juicer. After your done using the Samson, there are very few parts to clean, so clean up is a snap. The Samson contains a powerful and quiet induction style motor that is guaranteed for a full 10 years, and will provide many years of reliable service. The Samson is one of the most compact juicers in its class. The parts are top-shelf dishwasher safe to making cleaning a breeze. The outlet adjusting knob allows you to fine-tune the settings on the juicer to maximize the yield when juicing produce of different consistencies. From Apples to Zucchini, the Lequip Omni can juice it all. With the Samson you can now obtain a higher concentration of Essential Fatty Acids than eating the foods alone by making your own fresh oil. The first time we made Cold-Pressed Flax oil in the Samson juicer with oil attachment, it was amazing. It tasted fresher and had a "nutty" flavor. Oh, and the press cake, the dogs loved it mixed in to their dog food. It also makes a low fat crunchy snack. Create your own oils rich in Omega 3, 6 and 9 with your Samson juicer. Cold-pressed seed oils like sunflower, chia, flax, sesame, chia seed oil and more are a rich source of unadulterated, cholesterol-busting monounsaturated fats and essential fatty acids. Now you can get the benefit of these supremely healthy seed oils in their pristine, freshly-pressed optimum condition with the oil extractor attachment for the Samson Juicer. Please note: While this is advertised as "cold press", the press does create friction, which does create some small heat. We have measured this heat and it averages about 120 degrees when making flax oil.